Bloomsbury USA Childrens, 9781619632639, 32pp. 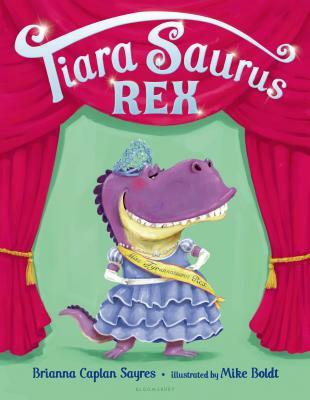 It's time for the Miss Dinosaur pageant and the girls are ready! Patty Saurus puts on her best dress. Stef O'Saurus covers her scales with jewels. Teri Dactyl practices flying and Sarah Topps practices hula hooping on all of her horns. But there's one dinosaur who doesn't need to prepare because . . .
Tina Rex always wins! She's a fierce competitor and her brilliant smile scares away the other girls. But is it really fun to win when you've chased away all of your friends? Tina's not so sure.